On Friday, I took a little road trip down to Puglia. I thought I’d document what happened once an hour to give you a sense of the trip, with my mobile phone (I’m hoping to get a new one with an awesome camera soon). Hope you enjoy! We’d already been awake for some time, and on the road for a bit. This was our first important stop, at Italy’s ever-present Autogrills, for coffee. 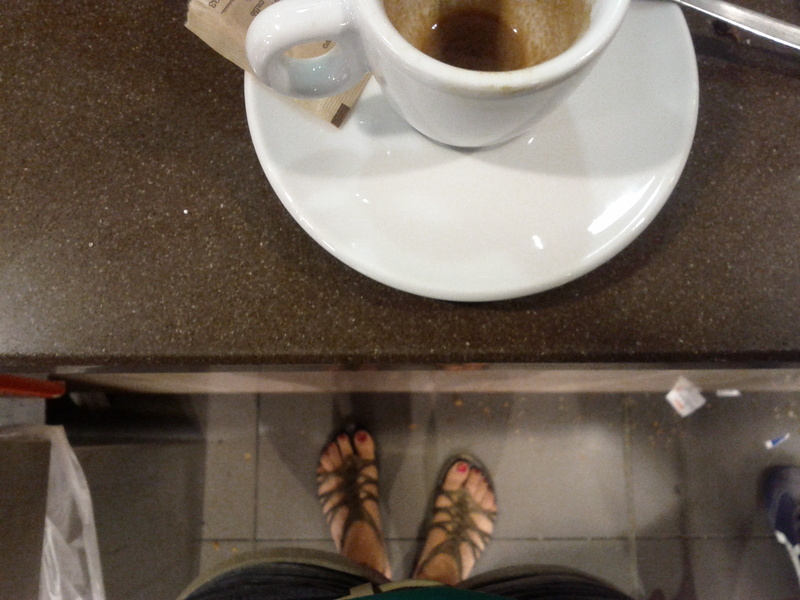 You can see the crumbs from other customers’ brioche/cornetti at my feet. Really needed that. We’re officially no longer driving in the dark. The sunrise peeks over one of my favorite overpasses outside Reggio Emilia. First gas-up. We have a car which runs on propane, and we have a small tank and have to stop more often. The sun is shining and all of the early morning freshness is now gone. It’s 23C (74F). Breakfast. A few handfuls of pistachios followed this banana. Do you pack food when you travel or road trip? I do. I used to love buying food at the stops but now I enjoy shopping before and having good snacks on hand. Don’t you love the sunray on this heavenly banana? Almost halfway through! Now we’re in Le Marche, a region I love driving through. I believe we’re near Loreto at this point. I fuel up with a Pocket Espresso to Go – the savior of all Italian drivers (picture not taken while driving). Last gas-up. I get mesmerized by the brightness and the colors of the gas station. Enjoy a little Autogrill still life. Like the last .1 miles of the half-marathon I ran last month, the last hours seem the hardest. Maybe I’m a little sleep-deprived at this point. Almost there. Just a kilometer or so away is the sea. I’m back to being a passenger. Arrival and immediate devouring of homemade lunch – melanzane ripieni, stuffed eggplant (not exactly like the stuffed eggplant on this site), a little mozzarella di bufala, mozzarella made with buffalo milk, fiori di zucca, homemade fried zucchini blossoms, and green beans with garlic and mint. Fight post-lunch slump with another coffee, and it’s time to work, too. WordPress image editor in the background – yeah! I look up to finally admire my view from my temporary office. It’s 33C (91F) out but there’s a great breeze and I’m in the shade, so it’s perfect. I finish working and call it a night. Do you road trip? Can you stand long hours driving or sitting in a car? Have a favorite playlist or music you listen to while on the road? I hope you’ll be posting more photos from Puglia as I’m planning a trip there. I like to pack some healthy snacks for road trips but leave the option open for a good ‘find’ along the way. Loving coming along with you on this road trip! The Autogrill still charms me and I love stopping there for caffe along the way–and I get a kick out of shopping there–so different from USA. You can pick up Parmigiano and Extra Virgin Olive Oil, a far cry from what’s on the shelves as I drive up The 5 in California! Cute shoes! Love road trips and enjoyed your hourly check-ins! @Susan – sooo many things there. I should have taken some more time to document my finds with the camera but we were in a hurry. @rinaz – it’s definitely not for everyone – I grew up with very long car rides so I guess I’m used to them now. We went on a 3-week road trip from eastern Switzerland to Sicily with plenty of stops along the way. We thought it was the best way to see Italy! On the playlist: The Mars Volta, Rage Against the Machine, and Electric Six! @Amanda – nice! I haven’t heard of two of those groups :) That’s going to be an epic trip. I LOVE road trips. I don’t have a car but once I do, I plan to take a lot of trips. Last year I drove from Rome to Acqui Terme (well, I was molto stupido to rent a stick but I digress). Music is a big deal and of course I had to together a playlist which included: Amy Winehouse (first CD Frank), Jamairoquai, Bob Marley, The Police, Beethoven, Stevie Wonder and Coltrane, and the Spice Girls. Hi, loved your trip and all the descriptions and photos. Was wondering about the one in Le Marche – was that near Loreto Aprutino? If so it is in Abruzzo I think – another beautiful region to explore. I love road trips, what I really enjoy about it is you got to stop on some place where you can get a snack or whatever while loading your tank. And while on the road I love listening to acoustic mellow music. Hello: I have been listening to the Eye on Italy podcast which seems to have disappeared. Can you enlighten me on what has happened. I am interested in Travel to Italy with my wife early this summer – perhaps to the south and am looking for ideas. @Malcolm – Thanks for commenting! We had to take a break for a while (we all have busy schedules & had to dedicate a bit more time to things that pay the bills) but I don’t think it’s gone forever. It may resurrect soon!